When I was a kid growing up in England, I had a great-aunt in Northern Ireland who used to send ‘care packages’ comprising things like Oatcakes, Soda Bread, Fruit Cakes heavy with Irish Whiskey, and an unusual delicacy, almost unheard of elsewhere, known as ‘Dulse’. This last item, I should hasten to inform you, is actually a variety of seaweed and, in England, in the 1960’s, seaweed was not even recognized as being something that could be eaten, let alone a substance that normal people would voluntarily consume. Nowadays, of course, seaweed has become a lot more familiar in the west. Almost all varieties, however, such as Nori sheets for sushi, Kombu as a flavoring for soup, and Wakame in salads, are all green in color. Red seaweed, like dulse, is far less common but every bit as delicious. 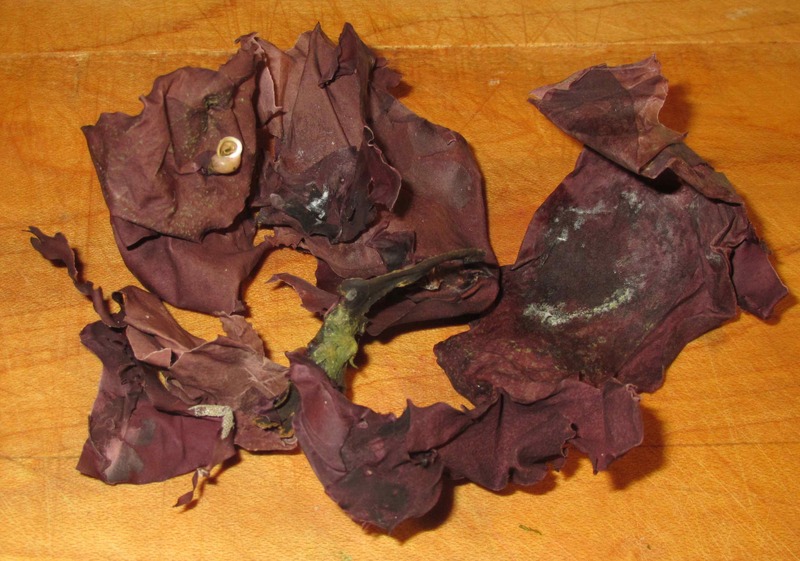 Here is the dulse out of the package. As noted, the seaweed is found not only in Ireland, but is also harvested on the shores of Atlantic Canada. Most famously, it is gathered on Grand Manan Island off the coast of New Brunswick, and, although I am not sure of it, I rather suspect that it is known in the adjoining state of Maine as well. 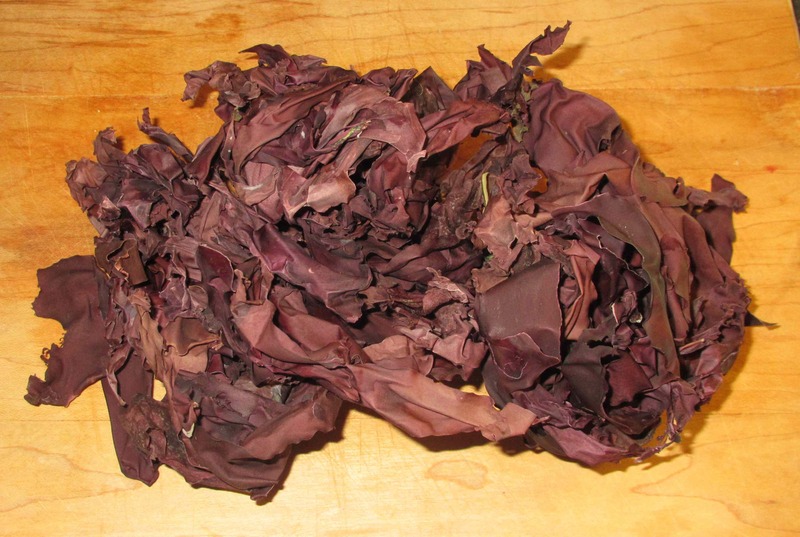 Dulse is primarily a snack food, eaten straight out of the bag, and it is a very healthy one indeed. It is 22 percent protein, has no fat, all sorts of nutrients, and comes in at about only 25 calories a cup. It is a great treat to nibble along with a cold beer and far better for you than peanuts or chips. I have yet to cook with it myself (though I mean to try), but I have seen little shakers of dulse flakes for sale that are intended to be sprinkled over food at the table. Another little benefit you get is that a bag of dulse often contains more than the dulse itself. Here you can see a fragment of green seaweed, a little maritime snail of some sort, and… the bit I like best, a dusting of sea-salt. Actually, there is very little salt on the dulse from this particular bag but, sometimes, whole fronds of it are ‘frosted’ with a white coating that is so tangy with the taste of the sea that it almost burns your mouth. 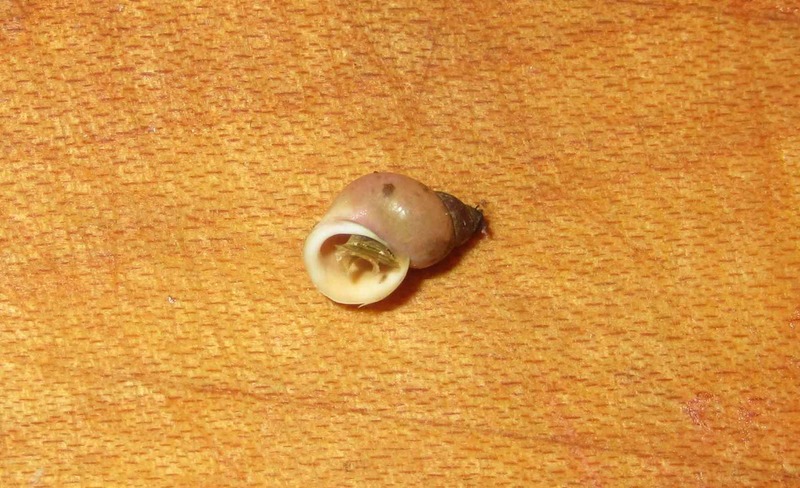 Here is a close up of the little ‘hitch-hiker’ that came with this bag. There’s not much to him, sadly. Hardly worth bothering to cook up, I’m afraid! I haven’t seen that in forever! You’ve given me the craving…. It was actually ages since I last had it too … I came across bags of it in a Fish Market in Ottawa. 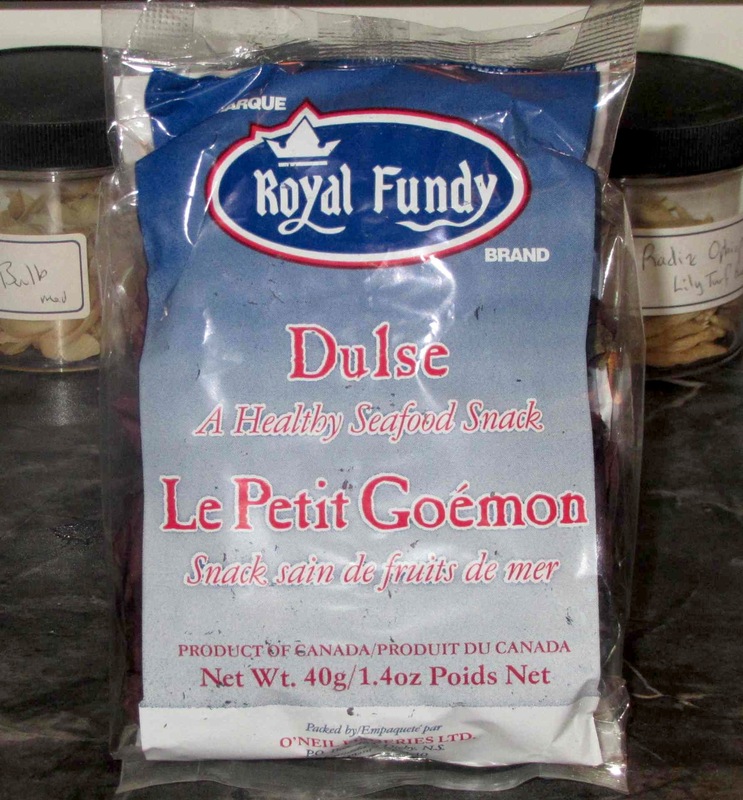 I have tasted dulse while traveling in Eastern Canada at an open market. Can’t say I was very taken with it. It must be an acquired taste. It’s been a long time! I had almost forgotten about this. Thanks for reminding. I liked this stuff as a teen and young adult and haven’t thought about it in ages.